As the nonprofit sector anxiously waits to see how low charitable giving will drop this year as a result of federal tax reform that significantly reduced giving incentives, there is some good news on the horizon. A new study highlights a major opportunity for the charitable sector to dramatically increase philanthropy by focusing on an historic transfer of wealth taking place in our country right now. A national transfer of wealth study just published by The Chronicle of Philanthropy with the Center for Rural Entrepreneurship/LOCUS Impact Investing shows that Americans held $75 trillion in household net worth in 2017. Nearly 57 percent of this wealth is held by baby boomers, the oldest of whom are turning 72 this year. The study estimates that over the next 10 years, if the U.S. economy grows at an average of 3 percent annually, nearly $9 trillion in wealth will transfer from one generation to the next. Over the next 50 years, $97 trillion will transfer across generations. If even a small fraction of that transferred wealth were to go to charitable purposes, the positive impact on the nonprofit sector would be enormous. Many communities across the country have already been using transfer of wealth (TOW) data for their state or region, combined with demographic and market data, to better understand the opportunities for wealth transfer in their areas and as a way to reach out to potential new donors and investors. This can be particularly useful data for community foundations. In Florida, for example, Florida Philanthropic Network conducted a transfer of wealth study in 2012 showing that more than $322 billion will change hands in Florida over a 10-year period. FPN worked through its community foundation members to show that if Florida captured just 5 percent of that transferred wealth as endowed charitable assets, it would result in more than $16 billion in charitable endowments and more than $800 million in new charitable giving each year—generating a 60 percent increase in legacy giving in the state. The state’s community foundations used county and regional data from the Florida TOW study to show the potential impact of the wealth transfer in each foundation’s service area. The Community Foundation of Collier County in Southwest Florida, for example, showed how capturing just 5% of transferred wealth in Collier County would result in $34 million in new giving each year to address critical needs in the county. This can be an important message for people who don’t think they have a lot of wealth and therefore think that leaving 5 percent of their wealth to a charitable endowment won’t make a difference. But when they see the collective power of many people in the county leaving just a portion of their wealth to charity, it can be a powerful motivator for people to consider charitable endowments when planning for their estate. The Florida study showed the potential positive impact of the state’s wealth transfer not just in the more populous urban counties but in rural areas of the state as well. For example, some of the state’s rural counties had the potential for a big increase in philanthropy due to wealth from family-owned agricultural businesses or from entrepreneurial efforts—wealth that sometimes wasn’t readily apparent. A number of other state and regional TOW studies have been completed in recent years in Mississippi, Kentucky, Maryland, Modesto and Stanislaus County, California and the Greater Chattanooga, Tennessee region. United Philanthropy Forum is pleased to be partnering with LOCUS Impact Investing to offer Forum members a 10 percent discount on LOCUS’ local or regional Transfer of Wealth Opportunity Analysis. You can learn more about the partnership and transfer of wealth opportunities on the Forum’s website. 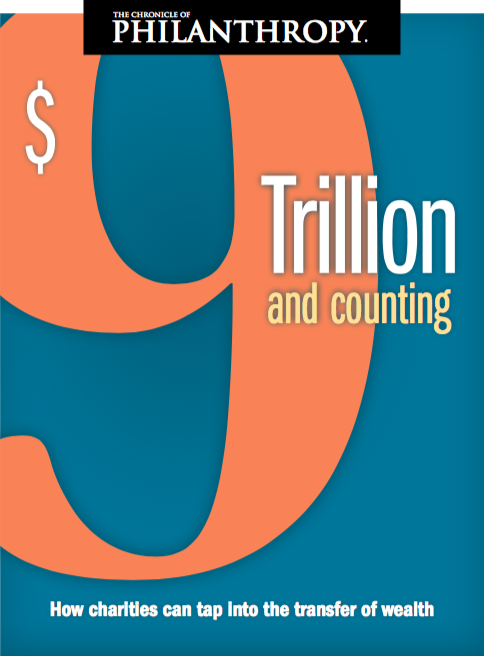 The 10-year, $9 trillion transfer of wealth is beginning now in our country. The actions that community foundations and others in the philanthropic sector take in this moment to ensure that some of this wealth is dedicated to charitable purposes will have significant long-term impacts on the health and well-being of communities across the country. Let’s take full advantage of this golden opportunity. Forum members: Sign up for the Forum’s May 23 webinar to learn more about the Forum’s partnership with LOCUS and how LOCUS’ Transfer of Wealth analysis can help you measure, capture and invest wealth within your communities.